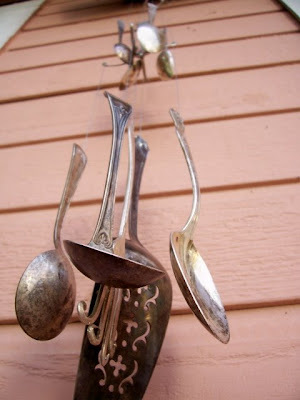 WhiMSy love: Flatware Wind Chime Tutorial! 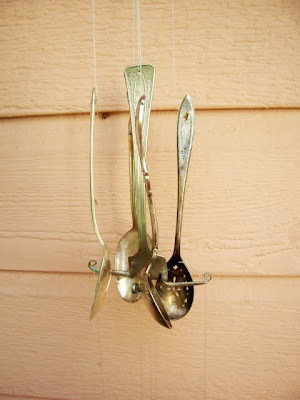 I've always wanted to make a wind chime from flatware. And, so I did! 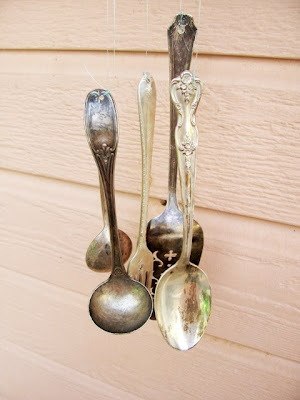 As you will see later on, you can just make this wind chime smaller--with just 2 tiers, instead of all three. The bottom grouping has larger pieces---a pie server, over sized soup spoon, etc. & I like the "weight" of it. 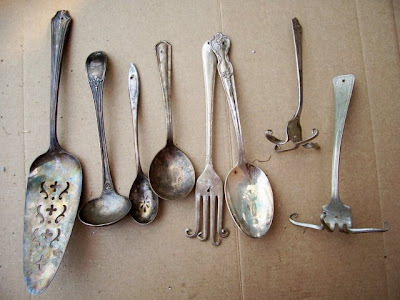 So, the first thing you'll need to do is gather your supplies: vintage silver or silver plate flatware......For the one I made you'll need a total of 3 forks & then 8 other pieces of flatware. 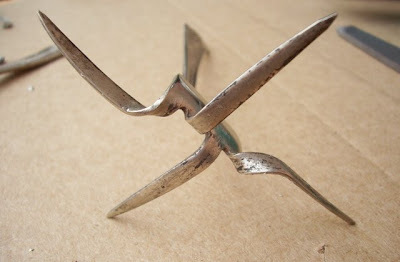 They could be spoons, butter knives, pie servers, etc. I just steered cleared from anything that could actually injure a passerby, or items that "never need sharpening". The other supplies you need are: 30 lb. 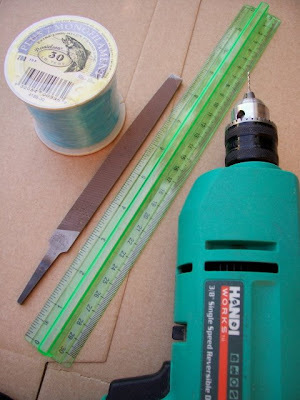 fishing line, a metal file, a ruler, a drill with a 3/32 drill bit, & NOT pictured but needed are pliers & scissors (to cut the fishing line). 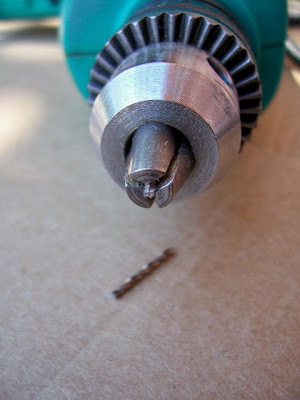 I started out using a 1/16" drill bit. I broke it while trying to drill. So, I used the next size up--a 5/16" bit. I broke that too. So see, I'm sharing my boo-boo's so you can save time. I used the 3/32" bit & it was fine. It took me a while to drill through the flatware. This is definitely not a quick project. It's an afternoon dealio. 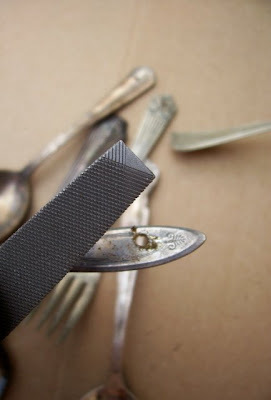 Drill through the "handle" or top part of each piece of flatware. Drill through the part shown in the picture for each fork that will become the center structure. 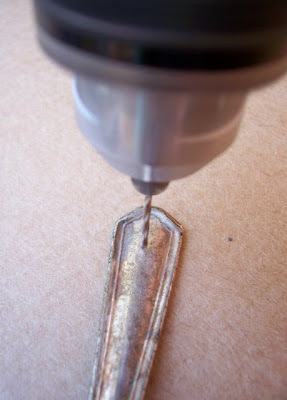 After drilling, you'll notice really sharp edges. File those off until smooth with your metal file. Now it's time for an Otter Pop break!! (And you can wipe the sweat off your brow too.) Man! It was a hot day. I'm pretty sure it was, like, a bajillion degrees. Alright, back to work. 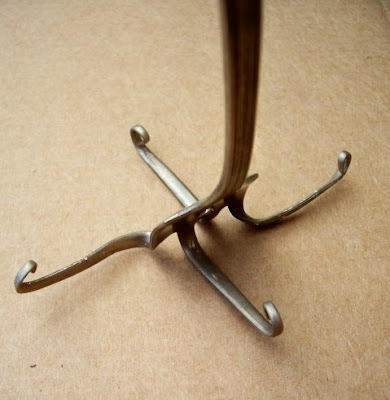 The top fork, middle fork & bottom fork will need to be bent with the pliers in this way. I had THIS fork already bent in my stash & I thought it looked cool, so I used it for the bottom fork. You can do that too if you want. ...so it will look like this. I took a picture of all the finished pieces but realized later that I left out a few spoons. 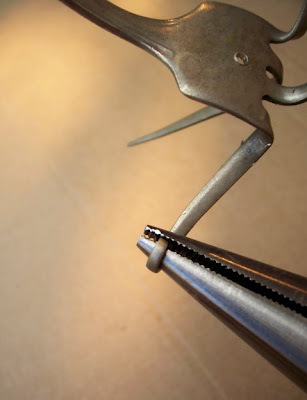 Now, tie a piece of fishing line onto the top fork as in the picture & leave about 5" between it & the middle fork. 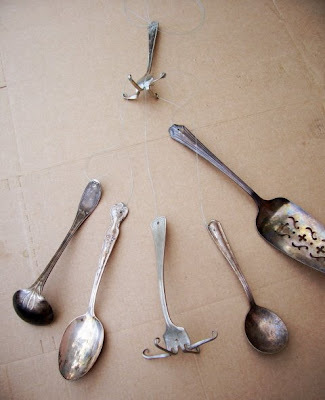 Then, from each curly prong on the top fork, tie 4 of your random pieces of flatware until the broadest parts of each hang equal with the middle forks curly prongs. 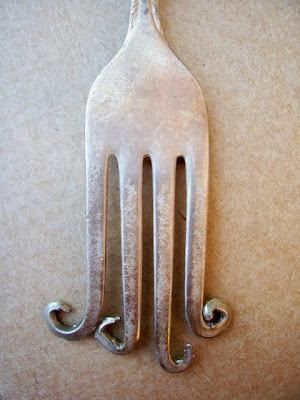 (This is so the flatware hits the middle fork prongs with a nice "clink" & "clang" sound.) You can stop here & be done & have a really cool wind chime, or you can continue to add the bottom level in the same way you just made the previous one: The middle fork (which is the fork in the bottom of the picture below) will have 4 other random pieces of flatware tied to its curly prongs & the bottom hole in that fork will have another fork tied to it, hanging below. ...& here's the bottom. I actually drilled a hole in the bottom of that fork in the last tier, so I think I may go back & add a decorative detail to the bottom---like a really ornate piece of flatware just hung there on its own. 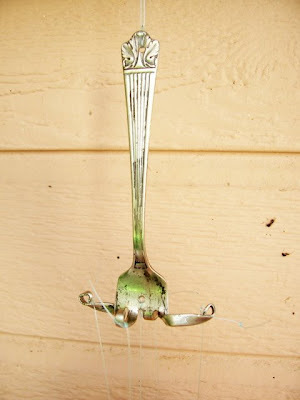 Oh, & don't forget to tie some string to the very tippy-top of the top fork so you can hang it outside. 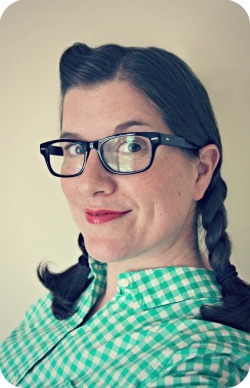 I hope you have fun trying this out! The sound it makes is totally neato!! I LOVE it!! Cheers to another "Summer Fun Idea"!!!! You did a great job on this tutorial! Thanks so much for the tutorial which was much helpful on this project. Any thoughts on how to keep them from rusting certainly around the holes? I trieds some clear spray made by rustolium and will see if that works??? I love this idea. 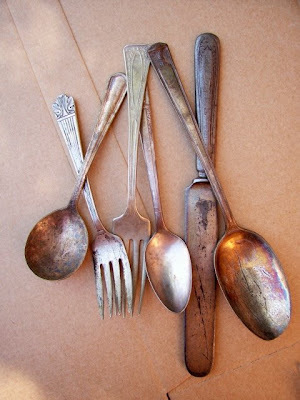 I have some bits of odd silverware of my mother's mother that is so icky with so much of the silver missing. It sits in my drawer and never ever gets used. I am going to get it out and do this with it so it will have a life! Thank you so much! I'll make a video of it as I make it! Thanks so much. I love love love the tutorial!! 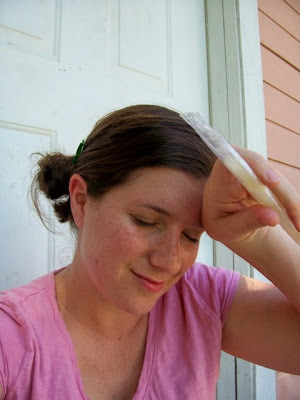 And it's not summer time here (right now) but I'm still going to take an otter pop break...just because you said so. :) Thanks so much!!! Thank you for this! 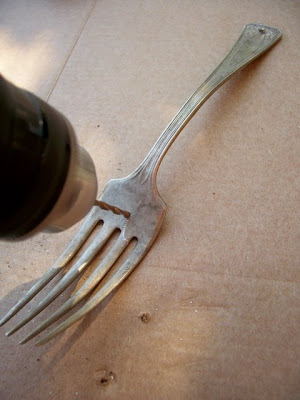 I've had a stash of forks saved up for a while and have been wanting to do this, but the drilling scares me. Maybe I'll have the guts to try it now! I am so happy right now!!! 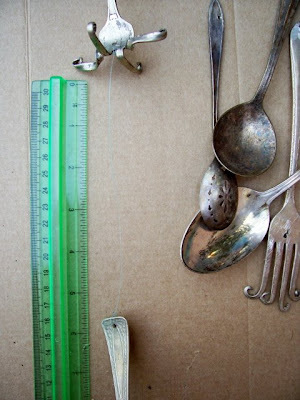 I had a flatware wind chime many years ago that got left behind when we moved :( Now I can make a new one!!! Happy Dance!